Defining the threat intelligence topology is very similar to defining the transformation and enrichment topology. The Management UI displays a second panel and populates the panel with message, field, and value information. The Sample field, at the top of the panel, displays a parsed version of a sample message from the sensor. The Management UI will test your threat intelligence against these parsed messages. You can apply threat intelligence to an existing field or create a new field. Click the (edit icon) next to a field to apply transformations to that field. Or click (plus sign) at the bottom of the Schema panel to create new fields. Typically users choose to create and transform a new field, rather than transforming an existing field. For both options, the Management UI expands the panel with a dialog box containing fields in which you can enter field information. 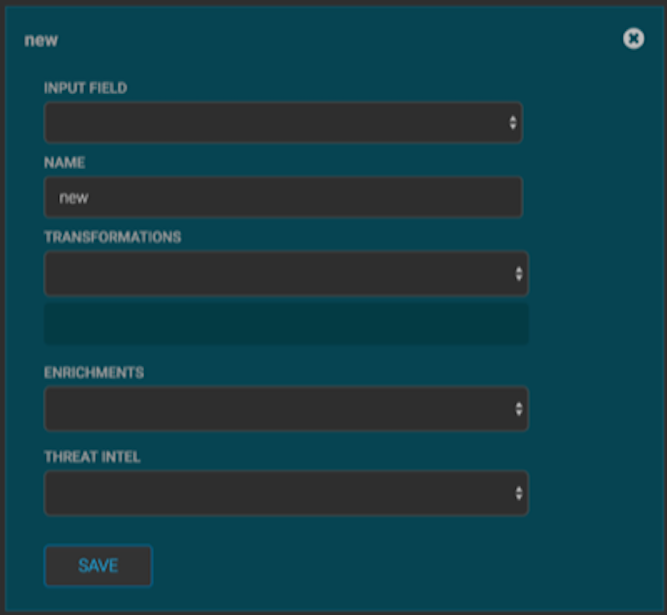 In the dialog box, enter the name of the new field in the NAME field, choose an input field from the INPUT FIELD box, and choose your transformation from the THREAT INTEL field . You can suppress fields from the Index by clicking (suppress icon). 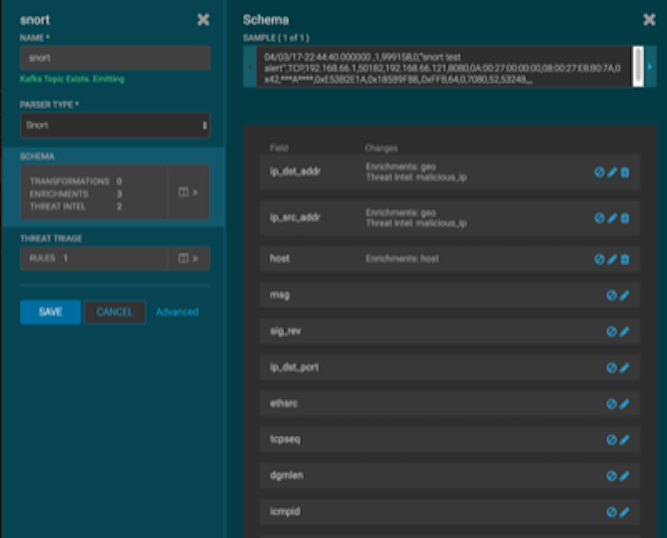 The Management UI updates the Schema field with the number of changes applied to the sensor. After you have finished enriching the telemetry events, ensure that the enriched data is displaying on the Metron dashboard.